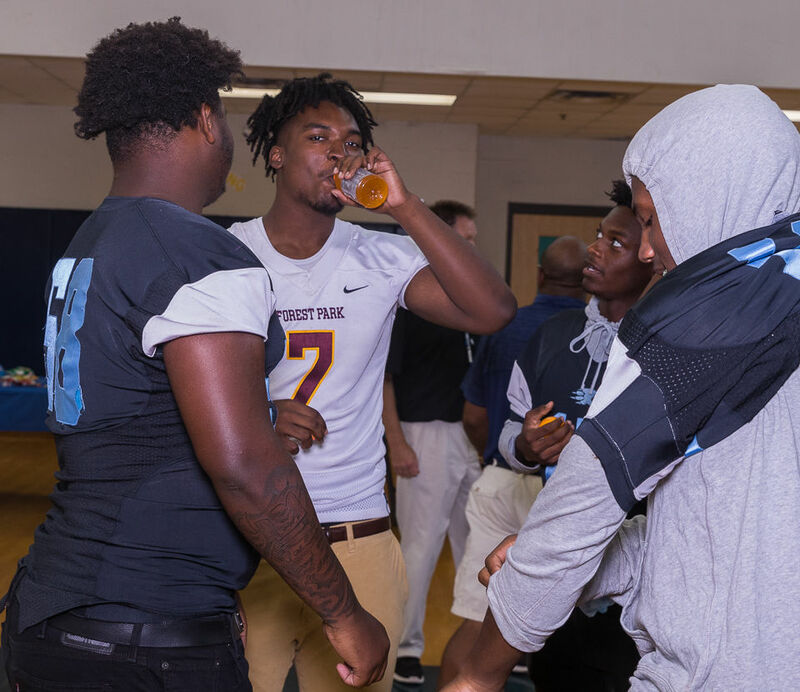 RIVERDALE — Drew High School once again played host to Football Media Day for Clayton County Public Schools Friday afternoon. 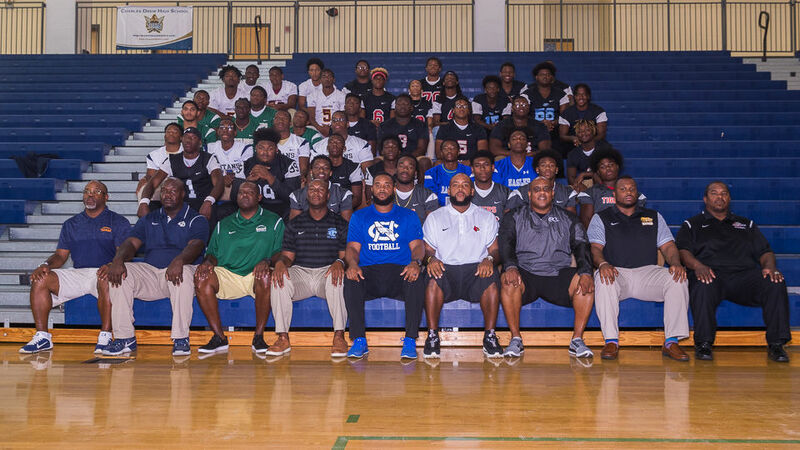 Head coaches for all nine county football programs were in attendance, each of whom were joined by select players expected to make an impact in 2018. A common theme across media day was the class of 2019’s talent level. Coveted recruits such as Forest Park’s Justin Eboigbe, Riverdale wide receiver Jaelyn Lay, Morrow defensive back Jamal Hill, Mundy’s Mill wide receiver Nick Manson, Lovejoy wide receivers Dayton Wade and Jerrod Means and offensive lineman Will Rogers, Drew wide receiver Tyrek Presley and Jonesboro offensive lineman Zach Hayes were all in attendance. Forest Park and head coach Martez Edwards got the show started. The Panthers will return to a region schedule in 2018, a prospect that excites the second-year coach. 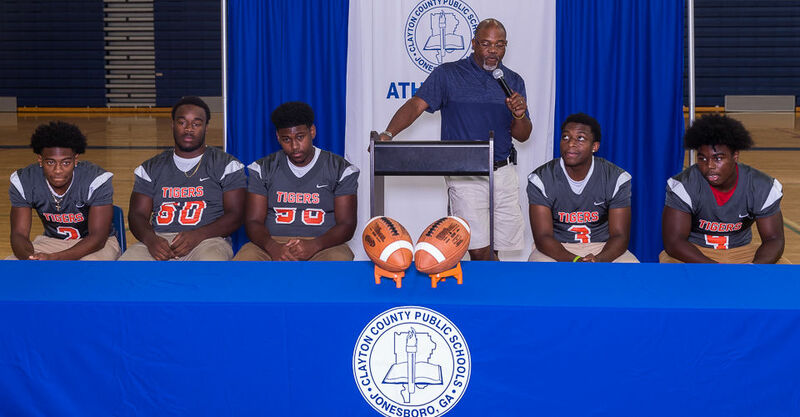 Edwards said his players are determined to move the program away form being the “eye sore” of the county. Eboigbe, Rojuan Dukes and Jacquez Bailey made up the Forest Park player contingent. Drew head coach Dorwyn Lyles brought Tyrek Presley, Thomas Williams, Deven Brantley and Aries Tyus to the event. 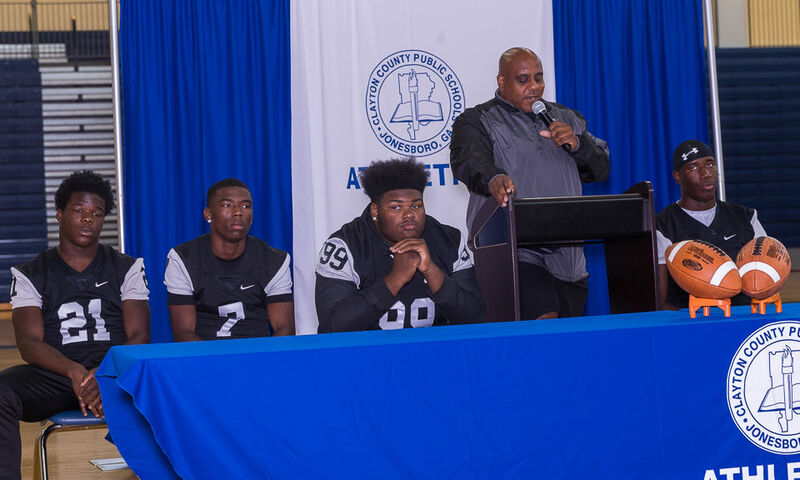 Lyles spoke about how all four players have played every year at Drew, a trait that’s rare in the modern high school football landscape. 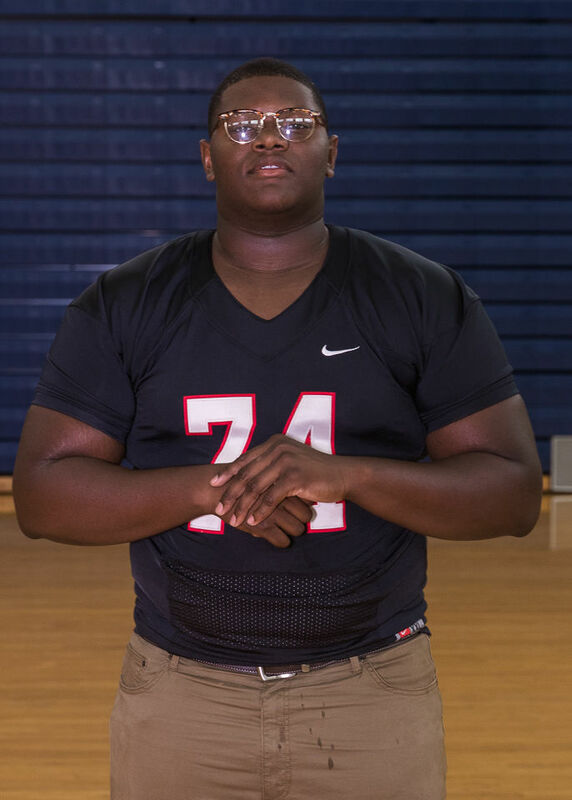 Jonesboro assistant head coach Nate Wardlaw discussed the program’s ambition after moving to Region 3-AAAAA. Wardlaw said the program is excited to renew a rivalry with Riverdale, while also taking on fresh opponents from Fayette County. Reginald Potts, Jalen Pugh, Kendarius Hilman, Zach Hayes and Walter Forte joined Wardlaw at the event. Lovejoy head coach Edgar Carson was joined by Kristian Grant, Jerrod Means, Lorenzo Robinson, William Rogers and Dayton Wade. 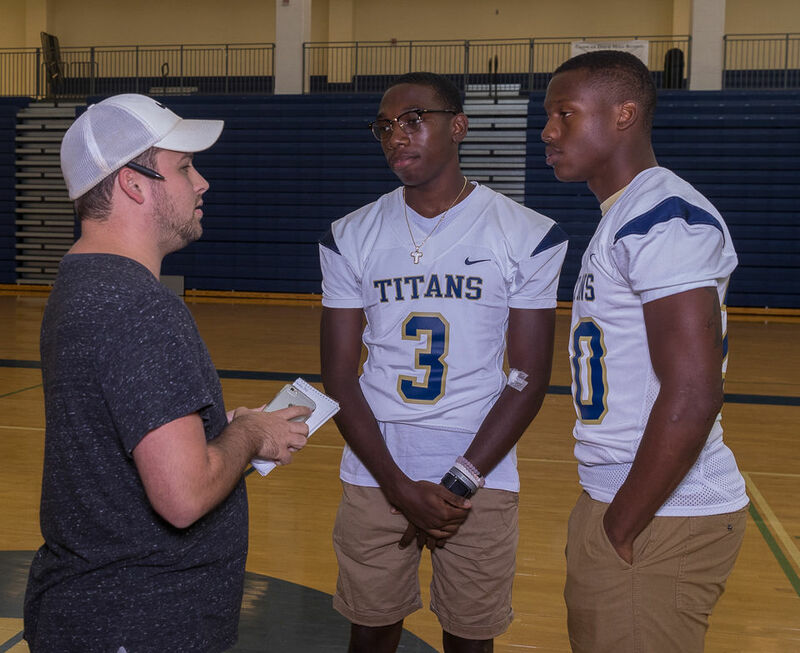 Carson spoke about the academic accomplishments of his players before touching on how the program plans to replace Clayton County Player of the Year Zion Custis. 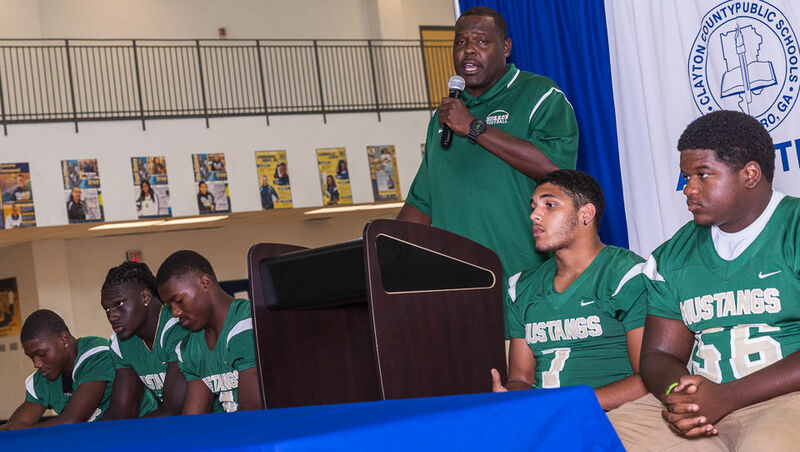 Jerome Weaks said he’s excited to begin his third year as head coach at Morrow High, a team many believe could snap a 20-year streak of missing the playoffs. Weaks brought Jimmy Calloway, Jamal Hill, Tabious Clemmons, Kris Clark and Dominick Dewberry to the event. 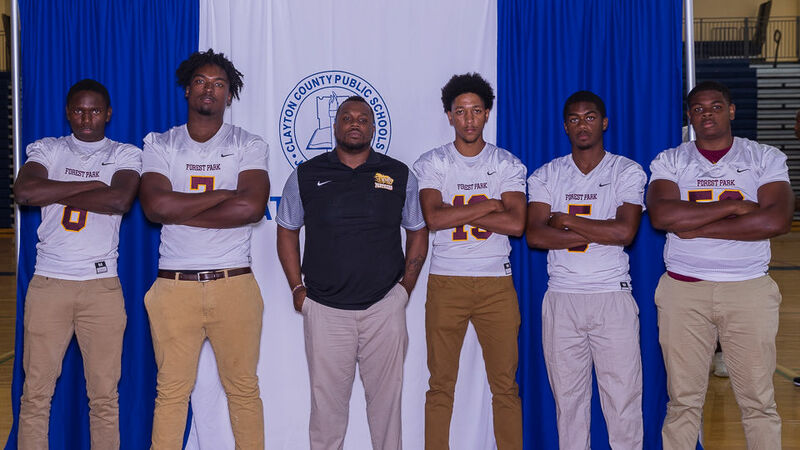 Mount Zion head coach Kevin Jones reiterated the program’s motto for the 2018 season — “finish what we started.” Jones was joined by Julius Wynn, Philip Wilder, Kameron Wilson, Raziel Adams and Gerrod Nicholson. Mundy’s Mill head coach Dwayne Davis will welcome back several players who missed time with injury last season. He was joined at the event by Nick Manson, Chase Welch, Raymon Pearson, Demarcus Harris and Keyako Moore. 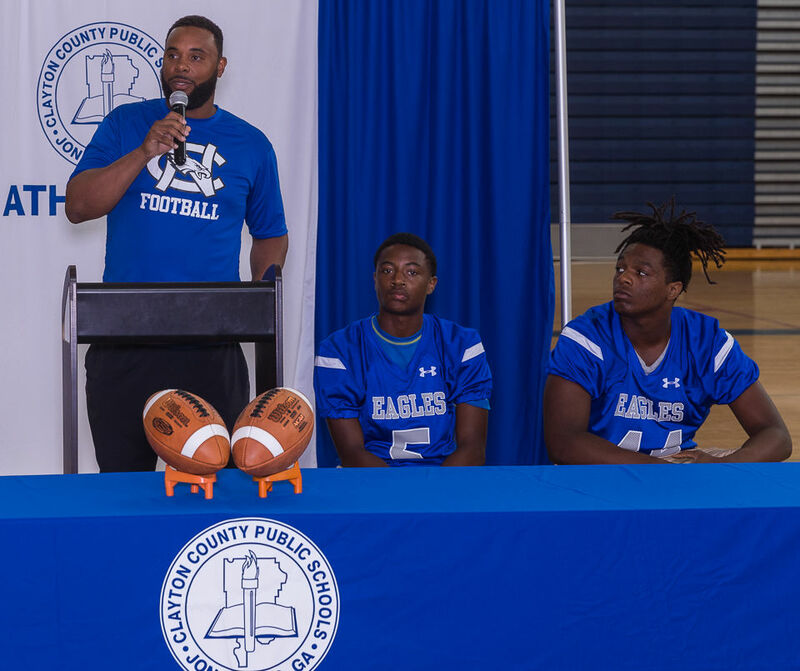 Cap Burnett was proud to represent the North Clayton Eagles for a third straight year as head coach. 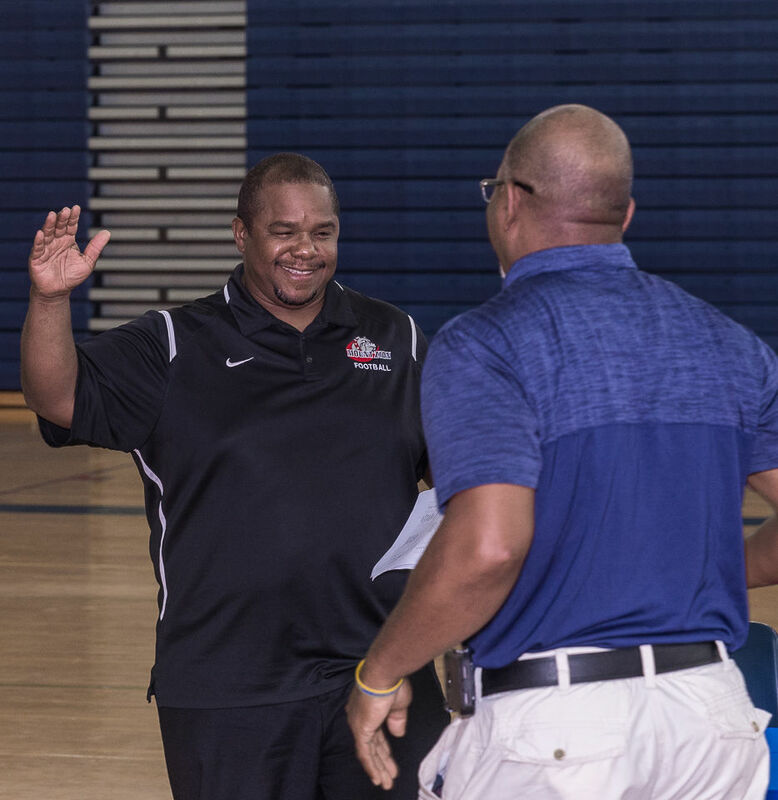 He also mentioned the battles he had with new Riverdale head coach Rodney Hackney in the early 2000s. Courtney Colbert and Terry Essex represented the program. Finally, Hackney discussed his happiness following a move back to Riverdale, a program he coached in the early 2000s. Hackney brought Jaelyn Lay, Wykevious Thomas and Chris King to the event.